If you love puzzling and engaging mysteries, these books are for you. If you love the world of the theatre, these books are for you. If you love mysteries peopled by witty and colorful characters, these books definitely are for you. Click ORDERING BOOKS to purchase FIVE DAYS IN MAY: THE BROOKFIELD MURDERS and SIX DAYS IN JUNE: THE HAVENPORT MURDERS in E-Book, paperback or hard cover formats. The Harrison Hunt mystery series is written by Paul Eiseman using the experiences he has amassed in his four decades in the theatre to create the delightful and original protagonist of the series: Harrison Hunt. A prominent and extremely talented New York City theatre director and playwright, Harrison Hunt (Harry to his friends) is many things. Often outrageous and cantankerous, often vain, hypochondriacal and self-involved, yet always witty, hardworking, and loyal to a fault to his friends, Harry discovers in this series that he has a previously untapped talent. In addition to his expertise as a man of the theatre and Shakespearean scholar, he has a talent for solving murders and solving them quickly. 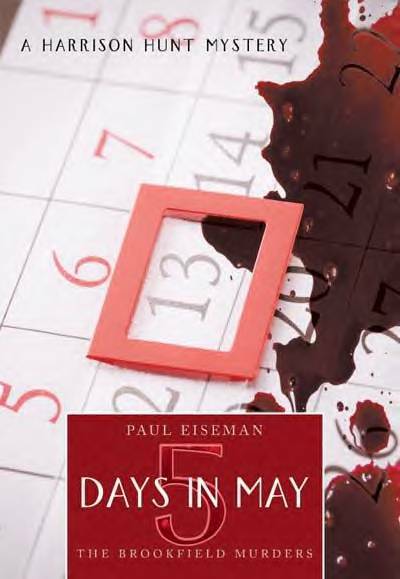 In the first volume, Harry, aided by his loyal longtime assistant Sophie, not only identifies a serial killer in the rural community of Brookfield where they are workshopping his new plays, he does so in only five days: FIVE DAYS IN MAY. 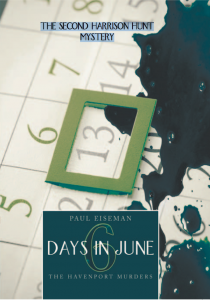 In the second volume, which takes place in the seemingly idyllic New England fishing village of Havenport thirteen months later, he solves an even more perplexing series of murders in six days: SIX DAYS IN JUNE. The third mystery (available soon) will take place in England. In this adventure Harry and Sophie unearth the culprit in one week: SEVEN DAYS IN JULY. And there will be ten more! Enjoy getting to know Harry, Sophie and the many other colorful and intriguing characters they meet in this series. Welcome to the world of Harrison Hunt.